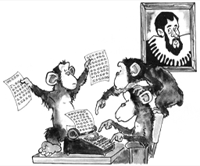 Some have theorized that an infinite number of monkeys pecking away1 on an infinite number of typewriters2 would eventually write the complete works of Shakespeare. So researchers at Plymouth University in England gave six monkeys one computer for a month. The monkeys “failed to produce a single word,” reports The New York Times. The six monkeys at Paignton Zoo in southwest England “produced only five pages of text,” primarily filled with a lot of s’s. At the end of the document, the monkeys typed a few j’s, a’s, l’s, and m’s. They also used the keyboard as their community toilet.